With Lyft’s IPO last week valuing the company at $22.4 billion after its first day of trading, and Uber’s imminent IPO expected to be around $120 billion, there is a lot of hype around “ridesharing” at the moment. However, one side of the story rarely told is that consumers using Uber and Lyft aren’t actually ridesharing. Uber and Lyft are modern, deregulated taxi services for consumers to hail a ride conveniently through their phones. There is a widespread misconception amongst the public and in the industry that Uber and Lyft are shared mobility services. This is perpetuated by venture capital funds whose sole ambition is to capture market share to inflate their stock price and bring a return to their investors. Clever branding combined with compelling marketing have succeeded in influencing consumers and misleading them into thinking they are consuming more responsibly, without presenting the real impact these so-called “ridesharing” services are having on the economy, on communities and on the environment. The impact of ride-hailing is significant, causing higher congestion in cities that leads to more carbon emissions, changes to consumer habits resulting in a reduction in the use of public transit and low wages with no benefits for drivers, amongst others. Moreover, the strategy to capture market share at all costs is creating a great deal of speculation in the market about the future of transportation without any clear indication that the current solutions are viable in the long-term. The free market will decide how long to subsidize this race to the bottom to provide cheap rides to the consumer but the long-term challenge remains; providing affordable transportation in a way that is financially viable, has a positive impact on society and is environmentally sound. This article debunks the myth that Uber and Lyft are ridesharing services. It presents their true social and environmental impacts, and hopes to encourage consumers to reflect on their habits and how they affect the world we live in. My name is Flo Devellennes and I am the co-founder of Poparide; a long-distance ridesharing platform operating in Canada. Poparide started back in 2010 when I saw an opportunity to solve one of the biggest transportation challenges in British Columbia: a lack of public transportation between Vancouver and Whistler. By filling empty seats in cars and helping people share rides to the mountains during the ski season, Poparide addressed an acute shortage in transportation by using vehicles that were already travelling on that route. Since 2010, the transportation industry has exploded with many different solutions attempting to capture the personal transportation market. A recurring theme I’ve noticed is a widespread sense of confusion about what is shared mobility, and what is not. I’d like to answer that question once and for all. In recent years, the confusion between ridesharing and ride-hailing became so prevalent that the Associated Press agreed in 2015 to refer to TNCs as “ride-hailing” and condemned the use of the word “ridesharing” when referring to Uber and Lyft. When you use a transportation network company like Uber or Lyft, you are not actually sharing a ride with a driver; rather, you are paying a driver to take you from point A to point B for profit—just like a taxi—as well as a middle man (the TNC) to facilitate the transaction. This distinction is important because ridesharing and ride-hailing operate under two separate legal structures and have different economic, social and environmental impacts. Uber drivers are hailed on-demand and drive people for profit. The fundamentals of this model are identical to that of a taxi service, except that typically taxi services are highly regulated in order to ensure the safety of the public and fair conditions for drivers. For this reason, Uber is under intense scrutiny in New York City, London and Paris and many other places around the world. Conversely, Poparide drivers are already driving somewhere and collect a small fee from passengers to offset the cost of their trip. This cost-recovery mechanism is not considered a commercial activity by government and is permitted under carpooling regulations. Ride-hailing is a for-profit endeavour and therefore uses an economic model built to maximize margins for the platform provider at the detriment of drivers who often make less than $10 per hour after costs. Ridesharing, on the other hand, aims to maximize capacity and uses an economic model to increase vehicle occupancy to reduce costs for both drivers and passengers and by doing so, reduces traffic, congestion and carbon emissions per trip. To illustrate this point, let’s analyze the cost of a trip from Hamilton to Toronto (80 km) in Ontario. $80 for the 80 km between Hamilton and Toronto. By booking two passengers, a driver collects $20, enough to cover 10L of gas at $1.20/L, plus extra for insurance and maintenance. This example shows the difference in price due to the difference in intent. Under the Uber scenario, the driver is hailed on demand to drive someone for 80 kilometers, which is a 45-minute journey in the best of cases. This explains the $80 price tag, which covers the opportunity cost of doing several other rides during that time. With Poparide, the driver is most likely a commuter and will be driving anyway, so their intent is not to maximize their time but to optimize costs. There is little opportunity cost for the driver and they are typically happy to collect $20 each way (two passengers paying $10 per seat) every day to cover their daily commuting costs. Such drastically different approaches to transporting people have very distinct impacts on society. In disrupting an entire industry by using technology and private drivers, ride-hailing has created competition in a market dominated by the taxi monopolies. This has led to lower prices for the consumer and better access to urban transportation, thereby reducing people’s reliance on personal vehicles. However, this disruption comes with side-effects which are now being understood through numerous academic studies. These side-effects include a decrease in public transit ridership and an increase in congestion in cities, along with low earnings and no benefits for drivers. 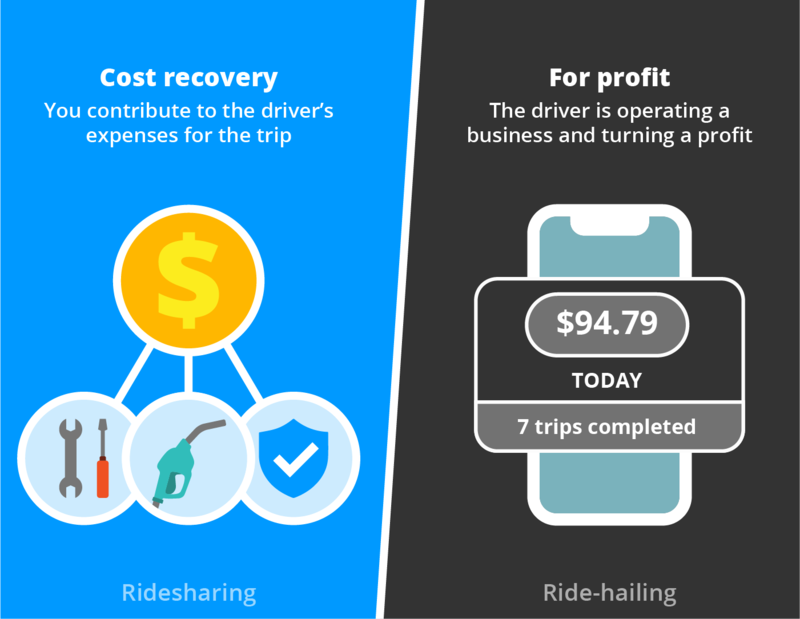 In addition, it appears that the driver is subsidizing ride-hailing platforms by bringing their own vehicle and accepting work for a low wage. Venture capitalists are subsidizing the passenger by allowing fares below cost – as evidenced by Uber’s gigantic losses ($4.5 billion loss in 2017, and $11 billion loss since launching in 2009). It is that subsidization that allows Uber and Lyft to out-compete taxis and take market share. It’s aggressive, short-term thinking and not a sustainable strategy in a business where barriers to entry are low. On the other hand, ridesharing uses existing legal structures and infrastructure to make transportation more efficient, thereby creating many positive social benefits. By creating a network of drivers that offer empty seats in their cars, ridesharing is becoming a new means of transportation in places where running traditional transit isn’t financially viable due to low ridership. By connecting smaller towns to the larger urban environments, ridesharing not only becomes an affordable solution, it creates new economic opportunities for regional areas. Ridesharing also helps connect communities and reduces the need for people to hitch-hike unsafely from the side of the road. By providing a structured platform for people to share rides, ridesharing has the power to create a safe, crowdsourced transportation network provided by the people, for the people. That’s not to say that there aren’t any challenges with ridesharing. Ridesharing has its own problems, but ones which are common to most online services – reliability, safety, etc. However, it doesn’t aim to compete with public transit and doesn’t need to be subsidized endlessly by venture capital to be financially viable. And of course, there is the environmental impact. With ride-hailing, a driver is requested on-demand at the tap of a button to drive a passenger to a destination of their choice. Under this model, passengers are not filling an empty seat on a pre-scheduled trip and therefore are not increasing vehicle occupancy or reducing the number of cars on the road. According to a study by City Lab, 20-50% of kilometers travelled by Uber and Lyft drivers are without passengers. Additionally, many ride-hailing drivers often travel far to reach lucrative urban areas before they even turn on the app. This adds more vehicles to the road, slows down all other traffic and collectively results in more fuel consumed and more carbon emissions. When ridesharing, a passenger rides with a driver headed in the same direction. That means that an empty seat is filled in a vehicle that is already on the road, thereby increasing vehicle occupancy. Increasing vehicle occupancy reduces congestion and the carbon footprint per passenger. To put it in numbers, the Canadian national average vehicle occupancy is 1.6 persons per vehicle, whereas Poparide averages 2.9 persons per vehicle on carpooling trips. Those extra passengers provide a tangible improvement in the use of private vehicles and reduction of carbon emissions per capita. Ridesharing and ride-hailing provide different solutions to inherently different problems. Think of ride-hailing from Uber and Lyft as the modern versions of taxi services. At the press of a button you can request a driver, see them arrive in real-time, know the price in advance and leave a review at the end of your trip. It’s great for a night on the town, going to the airport or getting to your meetings during the week. When ridesharing on a platform like Poparide, you are sharing the costs with a driver that is already driving in the same direction. This increases their vehicle occupancy and helps reduce the number of cars, congestion and carbon emissions per passenger. Ridesharing is typically used for distances covering at least 50 km, and you need to book your ride at least a few hours–or sometimes days–in advance. This service is great for complementing existing public transit systems and creating intercity services where it’s hard for traditional buses to operate. The good news is that ridesharing and ride-hailing services are compatible. In places where ride-hailing services exist, people can combine ride-hailing and ridesharing to get around. For example, if you need to get from Montréal to Ottawa, you could take an Uber from your house in Montréal to the metro station (a $15 ride for just a few kilometres, although we encourage you to take transit!) then hop into a Poparide and get a ride to Ottawa. The bottom line is, there is a discrepancy between what Uber and Lyft claim to be (ridesharing) and what they actually are (ride-hailing). It’s up to you to decide which means of transportation you use, but be aware your choices have a very direct impact on the social, economic and environmental landscape we live in. Interested in learning more about Poparide? Got a question, feedback, or suggestion on this article?